Photo: 1932-built Cua Bac Church. Cua Bac Church was built in 1932 by the French and is one of the most important in Hanoi today for Catholics. Browse places to stay in Hanoi on Booking.com. Book Now - Pay Only When You Stay. Originally called Church of the Martyrs, the 700-capacity church was designed in a somewhat eclectic style by French architect Ernest Hebrard, featuring a bell tower on one side of the main building and various Art Deco touches though the roof tiles remain in Vietnamese style. 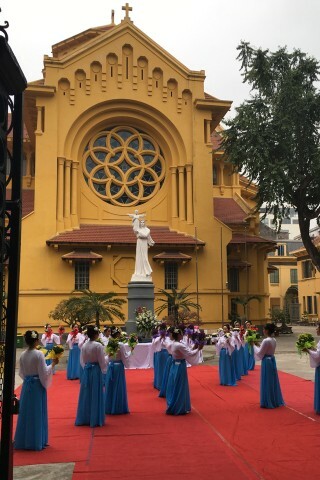 In November 2006, US President George W. Bush attended a joint worship service here among Vietnamese Catholics and Protestants, saying afterwards that: "A whole society is a society which welcomes basic freedom, and there’s no more basic freedom than the freedom to worship..." President Bush’s visit came as the United States had hailed the government for its improvements in advancing religious freedom. The church was renovated in 2014, when it was given a fresh coat of ochre paint, wiping away something of its erstwhile crumbling charm. Aesthetics aside, along with St Joseph’s Cathedral, Cua Bac is one of the most important for Catholics in the city. Today the church’s name of Cua Bac is taken due to its proximity to the Thang Long Citadel’s Northern Gate (Cua Bac); while you might not seek this church out unless you’re attending a service, you can pop your head in if you’re visiting the citadel without going out of your way. Browse our independent reviews of places to stay in and around Hanoi. Read up on where to eat on Hanoi. Check out our listings of things to do in and around Hanoi. Read up on how to get to Hanoi, or book your transport online with Baolau. Planning on riding a scooter in Hanoi? Please read this. See below for more sights and activities in Hanoi that are listed on Travelfish.org. Two or three days in Ha Long Bay?